Q: Yesterday, the China Central Television and the KCNA of the DPRK reported that Kim Jong-un, the Supreme Leader of the DPRK, went to the Chinese Embassy and the hospital where the injured of the April 22 traffic accident were treated and expressed his condolences to the Chinese side. Can you give us more information? A: On the night of April 22, a major traffic accident in the DPRK killed 32 Chinese citizens and four DPRK workers. The DPRK government attaches great importance to this. On the early morning of April 23, Kim Jong-un, Chairman of the Workers' Party of Korea, paid a special visit to the Chinese Embassy in the DPRK to express his condolences. Chairman Kim Jong-un asked Ambassador Li Jinjun to extend his sincere condolences to General Secretary Xi Jinping, to the Chinese party and government, to the families of the bereaved and the injured, and expressed deep sorrow over the many casualties caused by this traffic accident. On the evening of the same day, Chairman Kim Jong-un made a special trip to the hospital to visit the two seriously injured Chinese citizens and said that the DPRK would offer its best medical care and treatment and work with China to handle all follow-up matters. The Chinese side thanked Chairman Kim Jong-un for visiting the Chinese Embassy in the DPRK in person to express condolences and travelling to the hospital to visit the injured Chinese citizens. Upon learning about this unfortunate accident, the Chinese side coordinated efforts with relevant DPRK authorities to carry out emergency rescue, make necessary arrangements for follow-up matters and conduct investigation. The relevant departments on the DPRK side also reacted at the first time possible. The party and state leaders of the DPRK and heads of relevant departments went to the scene of the accident and the hospital to guide the rescue and follow-up work. 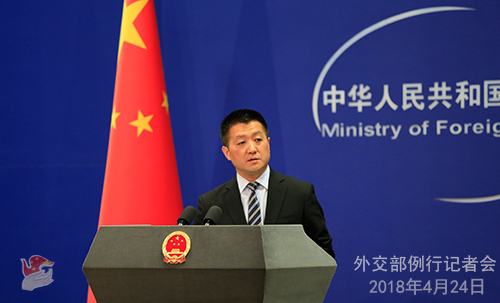 At present, the Chinese team, including the Foreign Ministry's working group and the Chinese Embassy in the DPRK, is in close coordination and collaboration with the relevant DPRK departments. We will keep you updated on the latest development. Q: Human Rights Watch yesterday released a report about sexism in job advertisements of some Chinese companies. These companies said that there are problems and they have promised to fix them. I was just wondering if China is aware of this report and do you have any comment on it? A: I have not seen this report mentioned by you. The Chinese government always requires the Chinese enterprises to operate in strict accordance with laws and regulations and will handle all the violations according to Chinese laws and regulations. Q: Chairman Xi Jinping and Prime Minister Modi will hold an informal meeting in Wuhan from April 27th to 28th. What led to the choice of an informal meeting? Any special considerations? A: The frequent exchanges between President Xi Jinping and Prime Minister Modi in recent years have taken place in various forms. One example is the "hometown diplomacy" as characterized by President Xi Jinping's visit to India in 2014 and Prime Minister Modi's visit to China in 2015. In addition, President Xi Jinping and Prime Minister Modi have met several times on the sidelines of the summits of multilateral mechanisms such as BRICS, the G20, and the Shanghai Cooperation Organization. On these occasions, they exchanged views on issues of common interest and reached many important consensus, which has offered strong guidance to the China-India relations and enabled a good working relationship and personal friendship between the two leaders. At the same time, in the face of unprecedented changes in the world today as well as uncertainty and instability in the current international situation, President Xi Jinping and Prime Minister Modi, as the leaders of the two largest developing countries, also feel that the two countries need to communicate in great depth on some long-term, comprehensive, and strategic issues embedded in bilateral relations and international affairs. The two sides agreed that an informal meeting would be a good idea so that the two leaders would make full and in-depth exchanges on major issues of common concern in a suitable atmosphere. We believe that more important consensus will be reached during the informal meeting in Wuhan which will contribute to the sound and stable development of China-India relations. Q: The US Treasury Secretary expressed his hope to visit China to discuss economic and trade issues. How is the discussion going on regarding the arrangement of his visit and do you have a timetable for the visit? 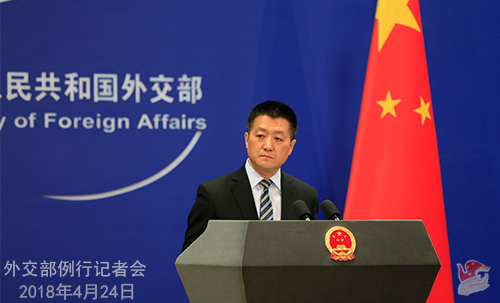 A: After US Treasury Secretary Steven Mnuchin expressed his hope to visit China, the spokesperson of the Commerce Ministry responded that China has received the information about the US side hoping to come to Beijing for consultations on economic and trade issues and we welcome it. That attitude remains unchanged, and I would refer you to the competent authority for detailed information. I want to stress that China-US economic ties are mutually beneficial in nature and have long been delivering tangible benefits to the business communities and consumers of the two countries. It is not surprising for China and the US, the two large economies, to have some problems in the economic field. These problems can be solved through bilateral consultations or within a commonly recognized multilateral framework. However, they can never be solved through unilateral means. Q: It is reported that yesterday, China has unveiled a monument to mark its construction work in the South China Sea. Do you have more information? What is the purpose of this activity? 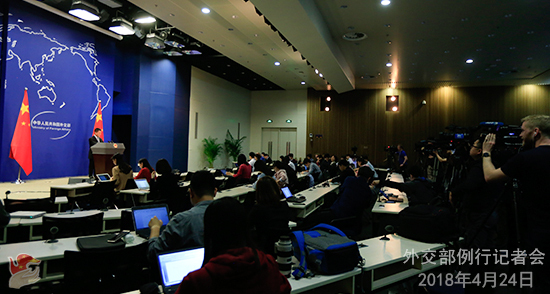 A: Yesterday, the Xinhua News Agency released the relevant information. China's construction activities on the Nansha islands and reefs mainly aim to improve the relevant facilities of those islands and reefs as well as the working and living conditions for the personnel stationed there, so that China could better fulfill its international responsibilities and obligations, provide more public goods to the international community, and help to safeguard the security of the South China Sea navigation channels which are vital to the development of China and regional countries.